pre-qualified when buying on Maui? Howard Dinits, Dinits Realty and I am here to tell you why you should get pre-qualified. Our market is hot right now and Buyers are competing for the same property. Just last week, I had a client who was competing with two other buyers trying to get the same condo. Our offer was actually a little bit less than the highest offer, but my client was prequalified and we delivered a pre-approval letter and proof of funds with our offer. That is why you need to get qualified. Call me. 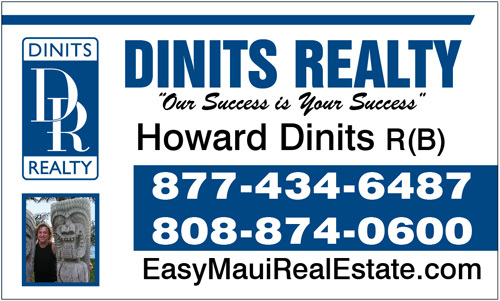 My name is Howard Dinits of Dinits Realty. 808-874-0600 You can check me out on the internet at https://easymauirealestate.com I want to be your real estate agent. Call me, lets get qualified!